Guide dogs have been used for decades to give individuals with vision problems true independence. Today The Seeing Eye, the oldest and one of the most successful guide dog programs in the world, is based in New Jersey on a 60 acre campus. The organization teaches dogs to become guides and trains their owners on how to work closely with their guide dogs for success. On January 29, 2017, The Seeing Eye program will celebrate its 88th anniversary. Since its inception, the U.S. organization has paired over 16,500 blind individuals with trained guide dogs. 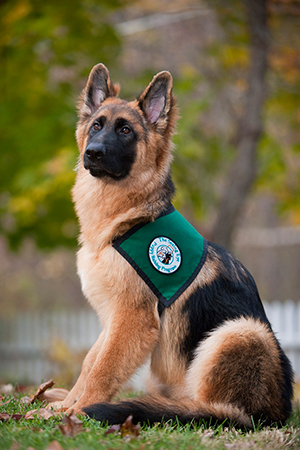 The earliest guide dogs were German Shepherds, trained to assist Veterans blinded in World War I. When a young American read about Dorothy Harrison Eustis’ work training dogs in Switzerland, he wrote to her and asked for her help. After training with a young dog named Buddy, Morris Frank returned to the United States and spread the word about guide dogs. In 1929, The Seeing Eye was founded by Frank and Eustis in Nashville, Tennessee and moved to Whippany, NJ in 1931. The organization grew quickly and in 1965 the Morris Township, NJ site was dedicated. Various renovations over the years have kept the campus beautiful and functional, with offices, student housing, a veterinarian’s office and kennels. In 2001, a breeding facility was opened on 330 beautiful acres in Chester, N.J. The Seeing Eye isn’t just about training the guide dogs and their owners. The organization has also been an active participant in advocating public policies and accommodations for those who use service animals. Today the Seeing Eye is on the leading edge of science and technology. The organization conducts DNA research and health testing with the goal of eradicating hereditary diseases in their dogs and uses a complex computer system to help calculate the suitability of particular dogs for the breeding program. They lead the way in everything from canine genetics to training and behavior modification. The Seeing Eye organization is a member of the Council of U.S. Guide dog Schools and a fully accredited member of the International Guide Dog Federation. To learn more about The Seeing Eye, visit their website at The Seeing Eye or their Facebook page. Celebrate The Seeing Eye’s birthday on January 29 by making a tax-deductible donation to help cover the cost of raising and training these beautiful guide dogs and their human companions so that those who are blind can gain new-found independence. You’re absolutely right, Emily! Thanks for visiting us!